The new US $36 million library at Chicago State University cost millions less than a traditional library because its storage stacks were designed for robots. More than 850,000 volumes are stored in 3-story high shelves of bins that are only accessible to high speed librarian robots. The students request a book on-line then the robots race to collect it and bring it to them. When a book goes back the robots re-shelve it anywhere that is convenient. 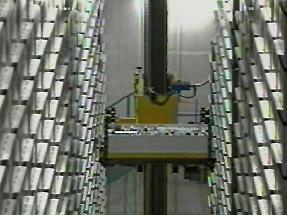 It does not matter where the book is placed as long as the robot knows where it is. About 250,000 of the more common books are still kept on traditional shelves for browsing by humans. There are interesting consequences to the robot library. Just like the robot garage, if there is problem with power or software then the library becomes almost useless. I wonder if the robots are smart enough to 'defrag' the shelves by moving the most popular books up front and keeping bins organized during slow times.